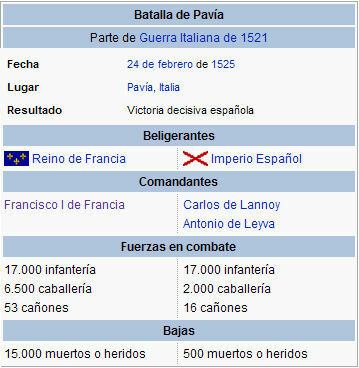 ...el rey de Francia y su escolta combatió a pie, cayó al suelo y al erguirse encontró con un estoque español en su cuello. Un soldado de infantería, el vasco Juan de Urbieta, lo hacía preso. The Battle of Pavia, fought on the morning of February 24, 1525, was the decisive engagement of the Italian War of 1521. A Habsburg army under the nominal command of Charles de Lannoy (and working in conjunction with the garrison of Pavia, commanded by Antonio de Leyva) attacked the French army under the personal command of Francis I of France in the great park of Mirabello outside the city walls. In the four-hour battle, the French army was split and defeated in detail. ....the French suffered massive casualties, including many of the chief nobles of France; Francis himself, captured by the Spanish troops, was imprisoned by Charles V and forced to sign the humiliating Treaty of Madrid, surrendering significant territory to his captor.